The theme for September 1 – Curiosities – touches on the notion of odd things in our communities. Perhaps it’s an unusual artifact that always draws your eye in a museum. Maybe a bizarre artwork in a gallery remains in your memory. And perhaps a sculpture or building or natural object standing on its own that just tweaks your curiosity. 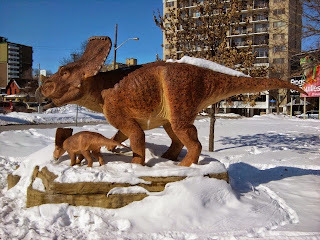 Here we have a pair of curiosities from William of Ottawa Daily Photo, in the form of a mother and baby dinosaur sculpture on the lawn of the Museum of Nature in Ottawa. William is a writer, photographer, and academic who can be found hiking a trail or climbing a rock face. He’s been a City Daily Photo blogger since September 2013 at Ottawa Daily Photo and longer as a writing blogger at Speak Of The Devil, where he’s frequently engaging in mayhem, chaos, and tweaking the nose of convention. Ottawa Daily Photo explores the national capital region of Canada for the most part, though from time to time ventures beyond. It’s a city that William enjoys living in, offering a mixture of natural beauty, remarkable architecture, and cultural opportunity… as long as one ignores those politicians William calls “awful.” It’s also a city whose winter is quite welcoming to William, who has been told that his enjoyment of the season is rather strange. Yet again, thank you for hosting Peter. This is, IMO, a tough theme. Shall be interested to experience the range of responses. I'm looking forward to seeing more as the day goes along across the world!